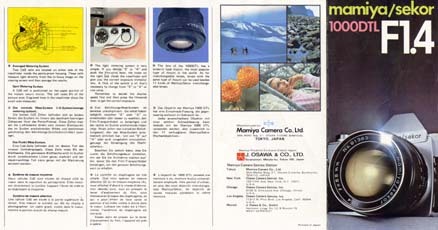 Here you can find various documents about the Mamiya NC series cameras. Some of them will be made available for download (for private use only). This is a 200 dpi scan of a nice little folded brochure about the Mamiya NC1000S camera. The language of the brochure is German. I resized the scans so they can be printed on standard DIN A4 size paper (approx. 75% of original size). The WinZip-file contains two JPEG files. 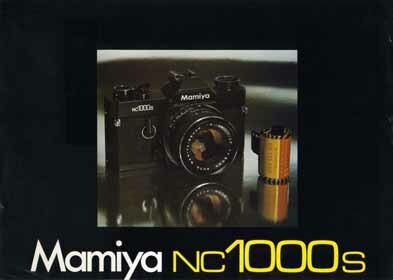 This is a link to an online instruction manual for the NC 1000 S camera which was created by Joerg Krueger and is part of his fantastic website about all kinds of Mamiya 35 mm SLR cameras. I scanned this 32 page catalog at a high resolution and turned it into a convenient PDF file. Unfortunately, due to the high quality and the many pages, the file size of this document is approximately 20 MB - way too large to be made available for download. But I can offer a custom made CD-R from this document. See below for details. I put many hours into this CD-R project and tried to get the best possible quality in the digital reproduction of this very helpful and interesting document. Besides the 20 MB PDF.file, the CD-R also contains all the individual 300 dpi scans (as uncompressed TIFF and high quality JPEG files) as well as the complete document as a Microsoft PowerPoint presentation. The CD-R contains a total of almost 180 MB of data. The CD-R also comes with a nice cover reproducing the original document as best as possible (see picture below). I really think that this CD-R has much more to offer than the original printed version. The PDF file format is extremely convenient. It lets you access the individual pages of the catalog very quickly. You won´t be disappointed by the stunning quality. The price of the CD includes packaging & shipping within Europe or to the U.S./Canada. Below you can see a screen shot of the PDF file opened with Acrobat Reader. You can navigate through the document very quickly using the icons on the left. This CD is really a pleasure to use. Thanks to to Pertti Rikkilä from Finnland I can now offer a download of the rare instruction manual for the Mamiya P-mount adapter. The WinZip-file contains a 300 dpi scan of both sides of the manual as a JPEG file. 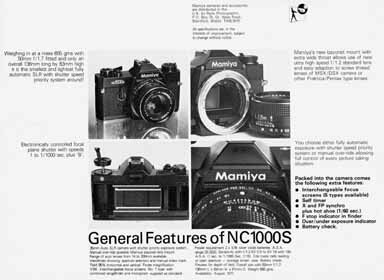 This might be the earliest document available on the Mamiya NC 1000 S. This one page flyer is from the U.K., and the text on the back announces the new Mamyia NC 1000 S camera and its features. At the end it mentions the expected availability of the camera: August 1977. The two WinZip-files contain a 300 dpi scan of the front and a 200 dpi scan of the back. To download both sides, please click on the pictures below. This is a test report on the Mamiya DSX 1000 B from the German photography magazine “Color Foto” (edition 6-76). It is in German and has some detailed information on the camera body (no lens information). The Mamiya DSX 1000 B did quite well in this test. 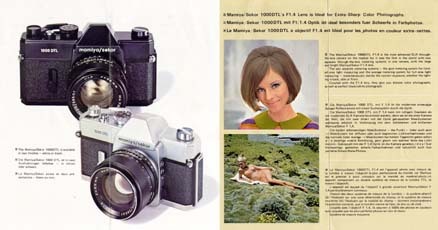 This is a brochure dedicated to the mamiya/sekor 1000DTL with the large aperture 55 mm F1.4 lens. The flyers shows the silver and the black version of the 1000 DTL. It is in three languages: English, German, and French. There is no year printed on the flyer, but I assume it is from 1968 or 1969.